When it comes to feeling that sense of opening, expanding and lengthening the body, Parivrtta Upavistha Konasana is one of those postures which can really help satisfy that sensation. Lengthening the calf muscles and hamstrings, while opening the rib cage and hips – this posture also teaches us a valuable lesson about the balance of simultaneously going to our edge while respecting our boundaries. If you’ve got into the habit of glancing around the yoga class to make sure you’re doing just as well as everyone else – then now is the time to break that bad habit. Even subconsciously – no matter how ‘yogic’ we think we may be – everyone competes on one level or another; pushing ourselves deeper in to a posture in an effort to compete with others is in no way serving our bodies. When we’re having a good day, it may not be difficult to remember this, but at other times it takes something more serious like an injury to teach us the importance of respecting our bodies. The postures are here to heal and serve us, we are not here to fit ourselves in to any particular shape for the sake of ‘looking good’…. No matter how impressive those yoga pose photos look on Instagram…. A useful way to practice without that urge to push or force ourselves further than is right for us, is to focus on the intention of the asana, or the primary purpose of the pose. This means focussing on one aspect of the posture you’re working towards, and it could shift each time you practice. For example, Parivrtta Upavistha Konasana may look to the outside world like a posture in which we try with all our might to touch our toes… which is never the point of any asana…. Instead, the focus could be shifted to opening up the outer ribs, maintaining stability through your foundations, or keeping the chest and heart open. This reveals a whole new world of practicing and means that even postures we’ve ‘performed’ a million times become new and intriguing each class. For me, Parivrtta Upavistha Konasana is about opening the side of the body and the heart center, and feeling expansive. The action of lengthening and expanding the side of the body is especially important, as this is primarily where our lymphatic and immune systems are located, and the ability to open and stimulate this part of the body helps to aid our systems in filtering and removing any toxins that may have built up within us. When we focus on opening and exploring different ways to move into a posture instead of getting into a certain shape, we can release the attachment of ‘doing’ a pose, which allows our asana practice to be limitless instead of a list of postures to ‘tick off’…. 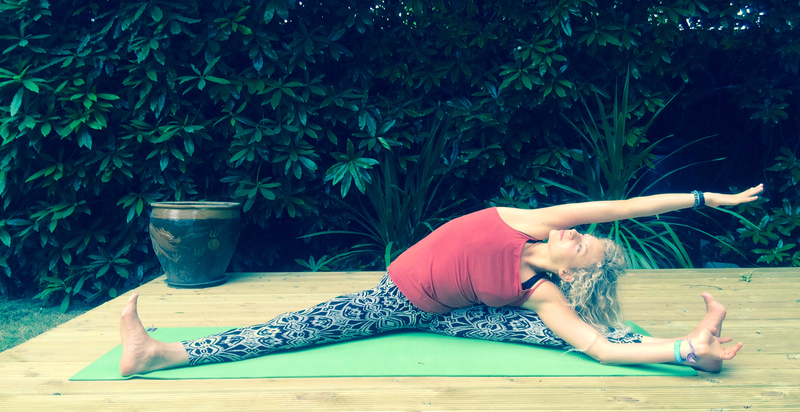 *If you’re particularly flexible in the hips, it’s important to be especially mindful of the sacroiliac or ‘SI’ joint in this asana. Those with more flexibility tend to have a little less stability around the lower spine and sacrum, and even less so when in a seated position. When we sit – especially in a wide-legged position – the sacrum does not have as much stability than it does when we’re standing, and combining this with twisting or folding can exacerbate the situation further. If the SI joint runs into trouble, this can cause painful ‘sacroiliac hip dysfunction’. So, this is where your mindfulness practice comes in flexible people. Resisting the urge to dive straight into a posture you know you have the flexibility for can be one of the biggest challenges. Holding back isn’t easy for many of us. But when it comes to spinal health… consider what’s really more important…. As always, move through your Surya Namaskar A, focussing on your Adho Mukha Svanasana in order to lengthen through the hamstrings and calf muscles. When you’ve moved through 3 to 5 rounds, or however many you feel you need, take a short flow of moving through Virabhadrasana 1 (warrior 1) Virabhadrasana 2, and Utthita Parsva Konasana (extended side angle pose) to get that sense of opening through the front and side of the body, and actively lengthening through the top arm. 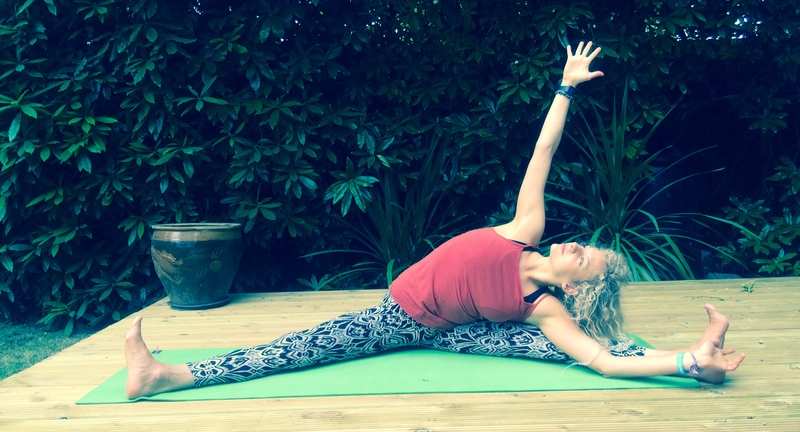 From there, move in to Trikonasana, and Parsvottanasana to further lengthen those hamstrings, and then move down to the floor to open the hips a little further. Once you’re seated, take Baddha Konasana and Janu Sirsasana, and finally come into a wide angled seated position. As you inhale, draw the arms up alongside the shoulders, reaching out of the fingertips while allowing the shoulders to be relaxed. When you’ve lengthened as far as you’re comfortable to go, once again come back to reconfirming that stability of the sitting bones on the floor, and the active kneecaps and feet. One the next inhale, reach the [right] arm up to the ceiling, once again very actively reaching through the fingertips. If you’re able to today, continue to reach the [right] arm up and over, maybe feeling an opening along the ribs and side of the body. If you can very easily reach the [left] foot, then go for it – in fact, don’t limit yourself to the foot, reach past the toes, always mindful of that sense of openness and length. Stay here for 10 to 15 breaths, or however long you feel is right for you. To transition out of the posture, once again ground those sitting bones down and flex the feet actively, and use your inhale and the abdominal muscles to come back to the center before moving on to the other side. Play with changing your intention within each asana in your practice; how many different ways can you find to experience each posture? Making each practice a way of exploring your body!